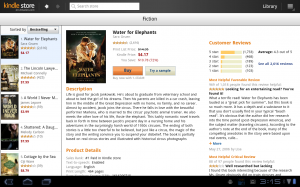 Today Amazon (NASDAQ:AMZN) announced that they were releasing an update to their popular Kindle for Android software that would optimize it for use on tablet PCs using Android Honeycomb (Version 3.0). The new software is intended to take all of the fun stuff that users liked about the existing software, add a few perks, and generally improve the way it takes advantage of larger screens than are common on Android based smartphones. It all sounds pretty good. The new features that users can expect from the update include an integrated storefront for the Kindle Store, an improved layout for newspaper and periodical display, an expanded enhanced dictionary with over 250,000 words, and the ability to control downloads of Kindle media. On top of this, of course, is the usual Kindle experience including single purchase reading from any compatible device and convenient access to pretty much any book you might happen to want to read. The big improvement is naturally just the fact that it is a version specifically for tablet PCs rather than a stretched version of the reading software for Android phones. This all ties in quite well with Amazon’s increasing presence in the Android marketplace. Their app store is clearly doing well and this will be just one more thing that ties users into the larger Amazon customer experience. If there was yet any doubt as to the efficacy of Amazon’s concentration on the media consumption side of gadgetry rather than on hardware profits, then we yet again have support in their favor. 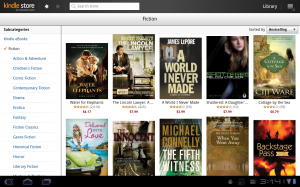 Overall, the biggest improvements seem to be those for browsing and shopping the Kindle store. It’s gone from a slightly unwieldy experience to that of literally having everything you’re likely to need at your fingertips right there within the app. The Magazine improvements are hardly surprising, but they’re more than a little bit noticeable too. Magazines and newspapers are the place where tablets really shine compared to eReaders, so it’s great to see full advantage being taken of the opportunities the hardware provides. While I have no complaints about a better dictionary or greater control over downloading, they’re more subtle when it comes to day to day use. I never really found the existing dictionary all that lacking, nor is there much of a problem in terms of books clogging my bandwidth. I would assume the latter feature is geared toward situations where you would rather be able to download your book via WiFi or where audiobooks are simply too large to make sense to download all at once. Neither one is anything to complain about, just not the fun flashy Kindle features that people tend to get excited about. Existing Android users will not see any loss of functionality, of course, in spite of using the same software. The smartphone friendly display mode is still present, and all the other new features are included anyway. It’s a good time to be an Android user who shops at Amazon, whether your device of choice is a Honeycomb tablet or not.